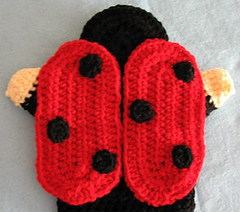 Puppet is 9-1\2" X 9" Scarf is 5" X 72"
You get the instructions to make cute lady bug puppets and scarf. Each puppet is big enough to fit most adult hands. Scarf can be made long or short depending on its use. 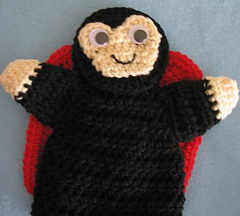 Each puppet is crochet out of Red Heart yarn and fabric paint for its mouth and wiggle eyes. One super saver skein will make both puppets and scaf. Fun and funky to wear! Great distraction to have when standing in line. 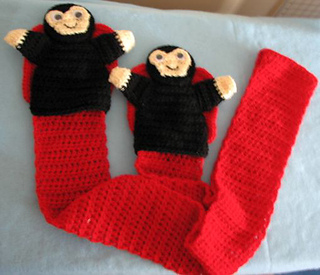 Make scarf short enough to go through a child’s coat sleeves and allow the puppets to dangle! Fun and mittens all in one! Very easy to turn the lady bug into a bumble bee!